Easy English Lesson for Beginners – Learn the basic colors in English! There is a way to remember all the colors of the rainbow: ROYGBIV. Each of those letters represents a color. Do you know each one of them? If not, watch this vocabulary lesson to add to your English vocabulary! You will learn about the primary colors and how to mix them together to get secondary colors. These are essential words you can start using today to describe all sorts of things like, for example, paint, pencils, hair, pictures, flags, cars, and virtually anything else. Don't forget to do the quiz at the end to make sure you've learned all the words: www.engvid.com/basic-english-vocabulary-colors/ TRANSCRIPT Hello. [Laughs]. How's that for an opening? No jumping up. I can't do it; too old. Today I'm going to teach you something very fun, easy, simple, but very important for painting. Are you a painter? Are you learning to paint? I love painting. I'm going to teach you about the colours in English. Very easy. Primary and secondary colour. So, let's go to the board. This is yellow. Okay. So, we have something called "primary colours". Now, "primary colours" means you cannot mix the colours to achieve the colour. So, the primary colours in English are "red", "blue"-"brown"-and "yellow". Now, I don't have a yellow marker. This is a highlighter. So, the primary colours in English are red, blue, and yellow. What happens is we are going to go a little crazy, we're going to mix the colours together. So when we mix the primary colours, they become "secondary colours". So, if you have red paint and you mix it with your blue paint-maybe by mistake, whoops-you're going to get "purple". Now, in the proper colour wheel, which is a wheel of wonderful colours, the purple is actually called "magenta". I don't know why. It's called magenta. So, magenta is just a beautiful purple colour. If you were to mix your yellow paint brush and it got into the blue a little bit too much, you would actually achieve the colour "green". Yay! The more green you... The more yellow you put in, the brighter green it's going to get. If you put in more blue, it's going to become a darker green. The next one... Dunh-dunh-dunh, what's left? Is if you get red and you mix it with yellow, it's going to become the beautiful colour of "orange". So, we start with our primary colours and we mix them all together to get our secondary colours. Now, this would happen to me a lot when I was painting: I would make purple, because that's my favourite colour. What's your favourite colour? Oh yeah? Okay. So I would make purple, and it was like: "Oo, I want to make green now", and then: "Maybe I want some orange." But what would happen is if I mixed all of these colours together, uh-oh, I'd get "brown". "Brown" doesn't have a special name, like the turd-ary colour, but what happens if you eventually mix all of these guys together, you're going to come up with, not brune, brown. So, brown is the mix of the primary and the secondary, without a proper name. The other cool thing about colours is the colours of the rainbow. Do you know the colours of the rainbow? Sometimes it's difficult for me to remember. It's important sometimes. But we've devised or we've made up a little saying to help you. We say: "ROYGBIV". Ready? "ROYGBIV". Now, "ROYGBIV" is not a word. I'm ROYGBIV. No, that doesn't make sense. It's not a word, it's not a verb, but what it is is an acronym, which means each letter represents a proper word. So, "ROYGBIV" is the order of the colours to make a rainbow. So, the "R" is red, "O" is orange, yellow-this is yellow-yellow, green, blue, "indigo"... Hold on. I lied to you when I told you that purple was my favourite colour. My ultimate favourite colour in the whole world is indigo. Indigo is a beautiful mix of blue and purple. It's not purple, it's not blue; it's indigo. So, indigo is a mix of purple and blue, and at the end of the rainbow, we have "violet". Now, "violet" you might also know as the colour purple, but it's the same name. Colours in English are confusing. Don't worry, we'll get to that as well. So, indigo and violet. So we have "ROYGBIV", right? So violet. Sorry, indigo and violet. So, maybe someone is giving you a quiz and saying: "Oh, name the seven colours of the rainbow in order." You're going to go: "ROYGBIV. ROYGBIV, okay. Red, orange, yellow, green, blue, in-, in... Ronnie's favourite colour, indigo, and violet. Got it! Bam!" You've aced your quiz or your test. You are a super colour genius. Don't forget that. What's your favourite colour? Do you have one? Get your paint brushes ready to mix up some secondaries and primaries. I'm Ronnie. 'Till then. Bye. 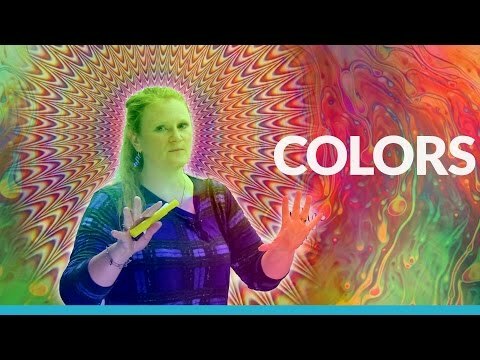 С видео Basic English Vocabulary: COLORS изучать английский язык очень легко.